Welcome to the first post in the Art of Africa blog series! My name is Alison Nicholls and I am an artist inspired by Africa. Read on to see how and why this huge, diverse continent inspires my art. Feel free to contribute your thoughts and suggestions for future posts. Beside me is the owner of the boma, a Maasai man in his 90s with a deeply lined face and gaping holes in his ear lobes. I am sketching one of his 12 wives, a middle-aged woman with a young child on her back, the top of the child’s head just visible above her colorful red shuka. 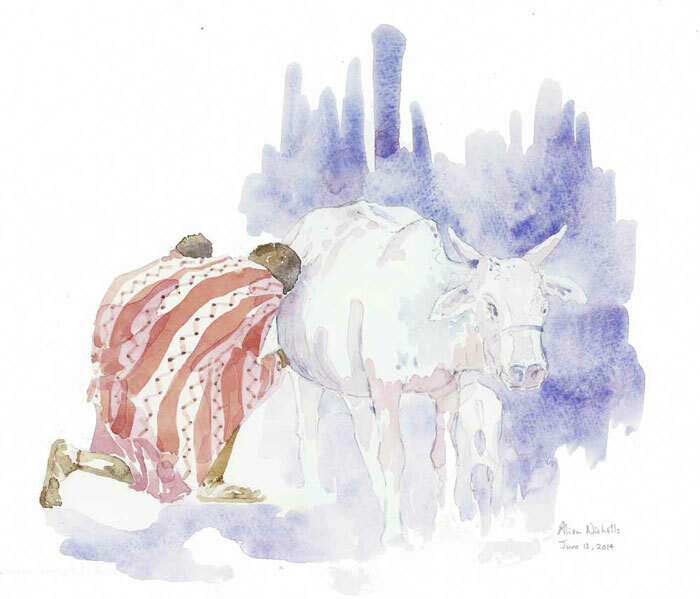 She is milking a soft-eyed cow, rhythmically squirting a stream of milk into a narrow-topped calabash. I would like to stand back and take in all the sights, sounds and smells of the boma, but now is not the time. Now is the time to sketch, and quickly, because the family’s essential daily tasks are more urgent than my desire to record them in my sketchbook. I do six pencil sketches in quick succession and before the cows head out to pasture everyone takes a look, the women shrieking with laughter as they see themselves on paper. I will add watercolour to the sketches later that day, something I often have to do because of time constraints. I don’t ask people to pose for me, I just sketch whatever they are doing, so they move around a lot and I concentrate on getting as many good pencil sketches as quickly as possible. When I sit down to add watercolour it is always without reference to photos or video, and always while I’m still on site (a rule of thumb I work by to ensure that my sketches really are ‘field’ sketches). There are advantages to adding colour a little later – it allows me to experiment a little more, hence the bright purple behind the cow! Sketching people is something I only began to do three years ago. Prior to that I painted wildlife and the occasional landscape, but my visits to the African People & Wildlife Fund (APW) in Tanzania changed all that. 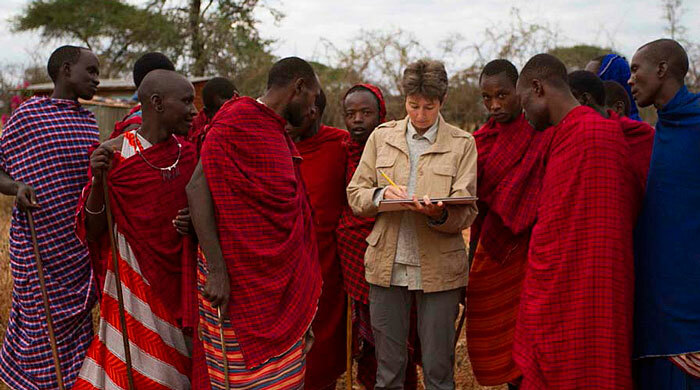 APW is a community-based conservation organisation helping communities manage their natural resources for the mutual benefit of people & wildlife. I have visited three times now and as I stood there in the boma, my previous sketching experiences came flooding back. 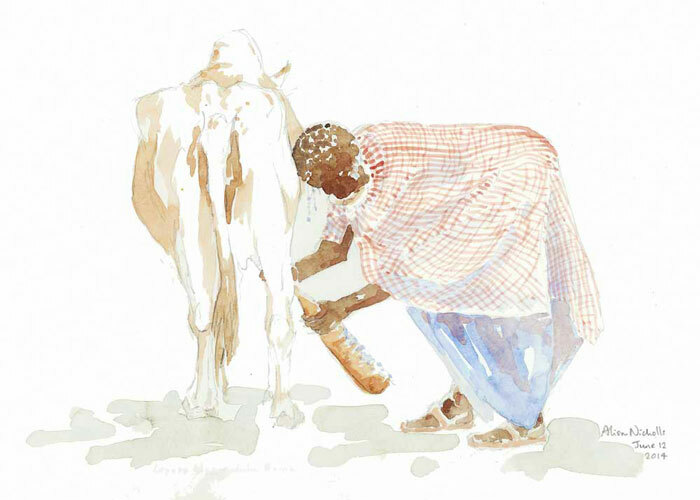 The lines of the women’s bodies and the folds of the shukas seemed to flow from my pencil as fluidly as the milk from the cow. For a field sketch artist that is as good as it gets. 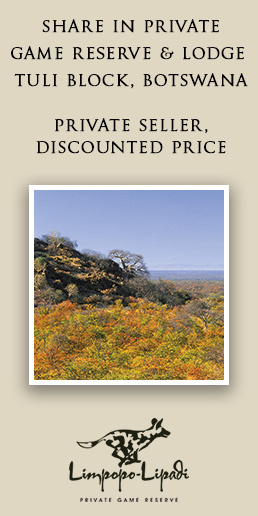 To join one of Africa Geographic Travel’s Art Safaris click here.